Hey y’all! I’ve been blogging so sporadically lately because Dell hates me, therefore my laptop won’t work. It even got to the point where The Boy bought me a new laptop BUT my IT buddy was able to fix the old one. So I said, “what’s the point of having two laptops” and made Mike return the new one. Fast forward two weeks and my “old faithful” decided that it would not only refuse to connect to the internet, but not play iTunes…which is a problem. Ha. I’m going to add a new laptop to my ever growing list of needs and wants. *sad face* (If anyone has a moneytree, please send some seeds my way.) Until then, I have to make a date with my pal so that he can fix me up again. Take a looksie at my blog. Do you see any differences? I’m pretending that y’all are nodding vigorously. LOL. Lindsay “The Fabulous” (that’s what i’m now calling her) of Scenic Glory gave my blog a facelift and tummy tuck. And I’m in love! She was such a dream to work with. She responds to emails in a timely manner and her bright personality shines through her keyboard. I promise. I just cant say enough good things about her. 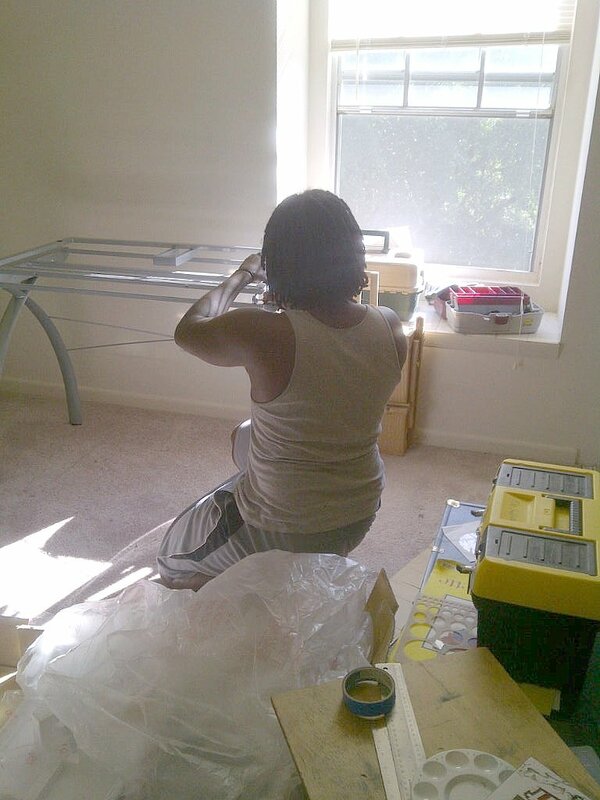 Here’s a random photo of Mike building his new drafting table. Ah, organization…how I heart thee! Change is real and its happening everywhere! Sorry to hear about your laptop. At least your blog is looking super cute!